Hello everyone! It’s Anna (al-handmade.com) here and I’m thrilled to be guest designing here on the Mama Elephant blog! 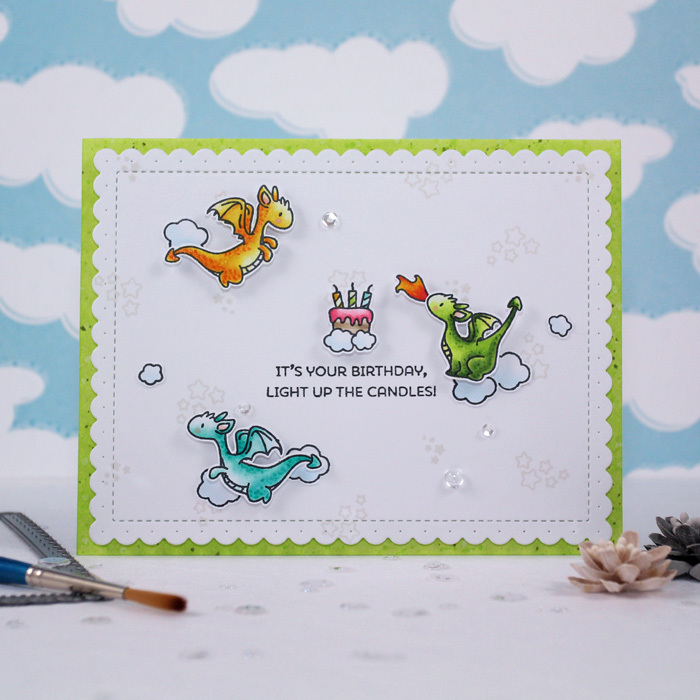 First I have a birthday card to share with you featuring the lovely Dragon Wishes Stamp Set. These mini dragons are irresistible, aren’t they?! :) Plus, you can easily combine them with the awesome Me and My Dragon Stamp Set for endless creative possibilities! To begin, I die-cut a panel out of white cardstock using the large frame from the Framed Tags - Chelsea - Creative Cuts . Then, I created a custom background stamping the tiny stars (included in the set) several times on my die-cut panel using gray dye ink. I stamped all the images with black ink and colored them with Copic markers. Once my coloring was complete, I carefully fussy cut them. Next, I stamped the sentiment from the Dragon Wishes Stamp Set in black on my die-cut panel and mounted all the images on it, using foam tape to add dimension. Finally, I ink blended and splattered the edges of a card base with Twisted Citron distress ink and foam mounted my front panel on it, adding some sparkling clear sequins here and there as embellishment. 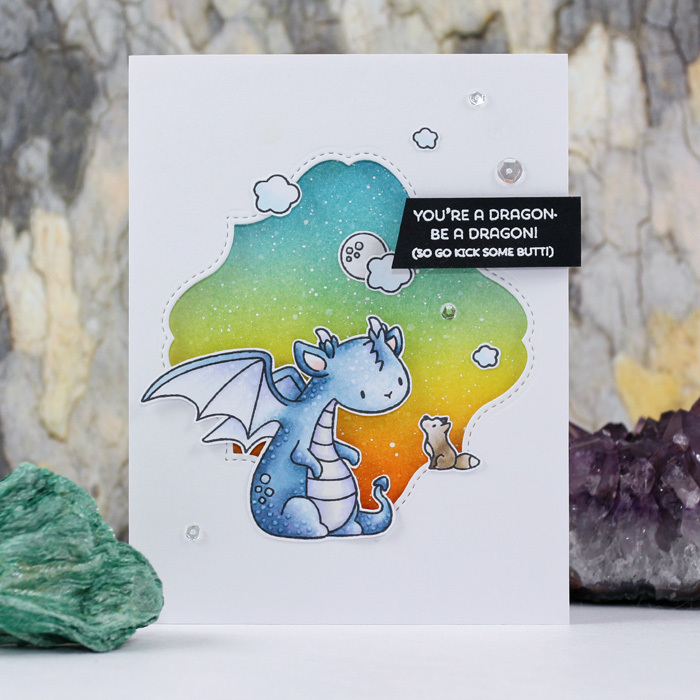 My second card I have a new card to share with you, highlights the Me and My Dragon Stamp Set. It was love at first sight with this set :) all its images are just magical and so fun to color! I started to work on my project by ink blending a card base with Broken China, Shabby Shutters, Mustard Seed and Spiced Marmalade Distress Inks, creating a smooth background gradient. Then, I die-cut a shape out of a white cardstock panel using a fancy frame from the Framed Tags - Union Square - Creative Cuts. I stamped all the images with black ink and colored them with Copics, adding some details and textures with my colorless blender. Next, I foam mounted the panel onto the ink blended card base and added all my fussy cut images on it, using foam tape for dimension. Finally, I heat embossed the sentiment, from the Dragon Wishes Stamp Set, in white on a strip of black cardstock and added it to my scene. I also added a bunch of sparkling clear sequins as embellishment. I have a fun spring project for you highlighting the adorable Hippity Hop Stamp Set. I had so much fun creating this card: these cheerful bunnies are just perfect for creating cute designs and happy scenes. die-cut two hills out of them using the Landscape Trio - Creative Cuts . I also die-cut some grass using the Fringe - Creative Cuts. a white cardstock panel before ink blending it to create a soft sky background. I stamped all the bunnies with black ink and colored them with Copic markers. Once my coloring was complete, I fussy cut all of them. it with the scalloped die-cut frame from the Framed Tags - Madison Avenue - Creative Cuts. Finally, I die-cut half of the sentiment using the Happy Script - Creative Cuts and heat embossed the second part of it on vellum, inside the banner shape (both from the Hippity Hop Stamp Set ). Finally, I have a new colorful card highlighting the fabulous Lots of Letters Stamp Set. I really love this set. In addition to being a very useful one, it’s very versatile and allows you to create tons of creative designs and personalized projects! ‘hooray’ die-cuts for dimension, adding a black layer at the bottom, slightly off-centered, in order to create an outer shadow. from the Lots of Letters Stamp Set - and heat embossed it in white on a strip of kraft cardstock. I used one of the borders from the Boutique Borders Stamp Set to stamp some dots on a card base with gray ink, building a custom background. Then, I foam mounted all my elements on it, adding a vellum layer between the card base and the smaller stamped panel. Finally, I added some sparkling clear sequins to embellish my card. Thank you so much for stopping by! Hope you enjoy all these projects! Oh so cute. I love the awesome scenes and images. Wonderful cards! Thank you for great inspiration.